We’re about 1/4 of the way through the 15th season of the HRL and looking at some of the league stats, I started to wonder, are the offenses struggling this year? With all of the hubbub in the MLB concerning HRs over the last couple years the term “launch angle” has become quite trendy. And since we’re the Home Run League (psst, that’s what HRL stands for noobs) I figured why not crunch some numbers and really see how 2018 compares to HRL history. Without a full season I figured I’d break this down to a per game played statistically structure. In terms of key offensive stats league wide, HRs, Runs, Strikeouts and Batting Average were the areas I decided to focus on. Right off the bat (no pun intended) we can see that there are distinct “Eras” in the 15th great years of HRL play. The originals can attest that there was for sure a shaking out period early on and a lot of new guys that really had to figure out the game. The large league expansion to 16 teams in the second year was actually the low point for key offensive statistics in the history of the HRL. After the first 4 years a power shift came into play in 2008. (Ironically that was my first year in the league 😊) That trend continued until the HR numbers peaked in 2011 and 2012 at 4.2 HR hit per game. Batters struck out less, and batting averages were up. For the first time ever the league averaged more than 10 runs per game. It was the golden age of HRs in the HRL. Sanchez was happy, Dr. Seuss was not. In 2013, we can see a slight blip occur in the K’s/game. They rose above 15 for the first time in a couple seasons. Offensive numbers were still solid, but over the next 5 years the overall trend has turned toward the pitcher. 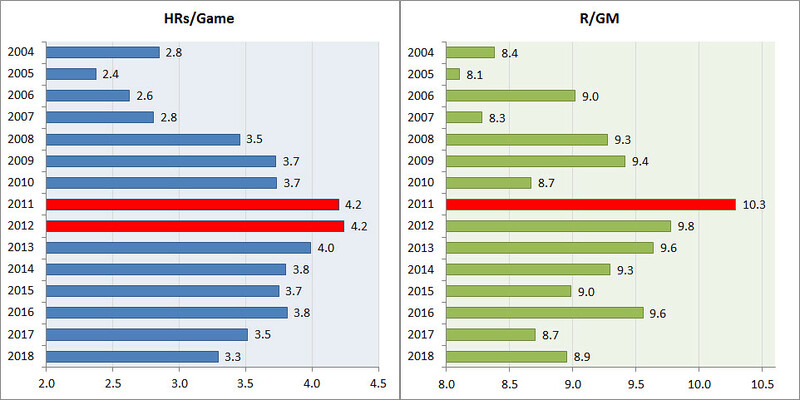 So far in 2018, HRs per game are at a 10 year low. 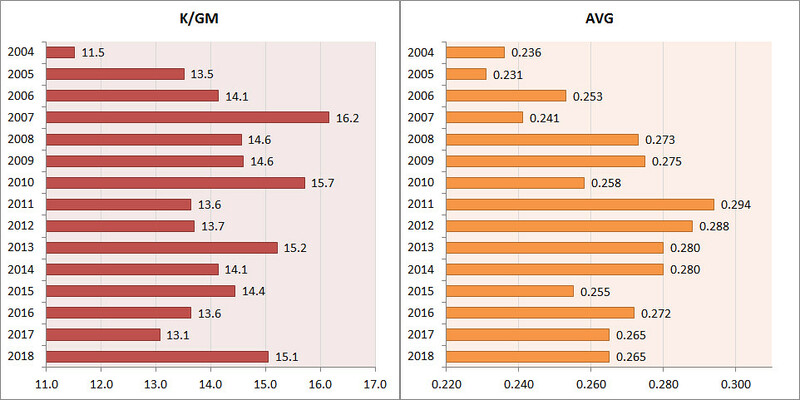 Strikeouts per game are near the top and the runs score per game aren’t quite in the realm of the “Steroid Era.1” Guys are still getting on base, but overall batting averages have dipped over 20 points from 6-7 years ago. It’s still early in the season and maybe many of the HRLers are still knocking the rust off from the long, grueling winter. The humidity will rise, the temps are sure to sit in the 90s in July and many pitchers will likely wear down after the All-Star break. We’ll just have to wait and see in year 15th of the HRL proves to be the new “Era” of the pitcher. 1. Steroid Era – During the peak of the HR age (2011-2013) many HRL onlookers believed that hitters were getting a competitive edge at the plate with untested supplements.